I have been to so many worlds, seen so many galaxies. I have seen skies of blue and gold, spined oceans of roiling madness, titanic steepled towers built for a purpose long since lost. But I have never seen life. I have encountered only endings, every story long since concluded; I have never seen a planet thriving. Is this it? Have all planets run their course? Are the conditions of the universe such that life can no longer prosper as once it did? Perhaps, perhaps not. I am no scientist. I’m just a traveller, telling my story. Let me tell you of one of the many worlds I have seen. The only planet of a binary star system, its orbit was wide and eccentric. Having scanned the planet and found it surprisingly habitable, I landed by the most ancient of ruins I could find, and chose to wander my way around the world, tracing its history as best I could. It’s a way to pass the time, when that is all you have. This planet had borne various races of burrowing creatures. It seemed that life had evolved from the oceans to the underground, ignoring the dry surface entirely. I discovered ancient records telling of how poisonous the skin of this planet was, how vile and toxic the ground had become from some awful reaction in the atmosphere. I found no such toxins, but carried on with caution. The first sentient civilisation built grand networks of caverns underground. The wiser they became, the further underground they fled, constantly fearing the poisons of the surface. It seems they were right to fear, too, for I discovered records that suggested the poison had begun to seep deeper into the soil, and those that still lived close to the surface died this way. It was in an especially deep tunnel, so close to the centre of the planet that these dark places were surprisingly warm, that I discovered a tunnel upward. Not a gentle incline, either, but a sharp ascent that brought me back to the surface far sooner than I had anticipated. Here is where I discovered the next great civilisation of this planet’s history. They had discovered a method of filtering the poison from the ground, sucking it away and ejecting it into firm, unyielding masses of gel they abandoned in the least habitable lands. In this way, the race found themselves as the first living beings on the surface of this planet, and soon they used their new technologies to spread across its skin. I found monumental cities that stretched across continents, and great rails that once carried trains between them. I found the remnants of some third great people in a stony valley, far from the steel hives I had come to know before. 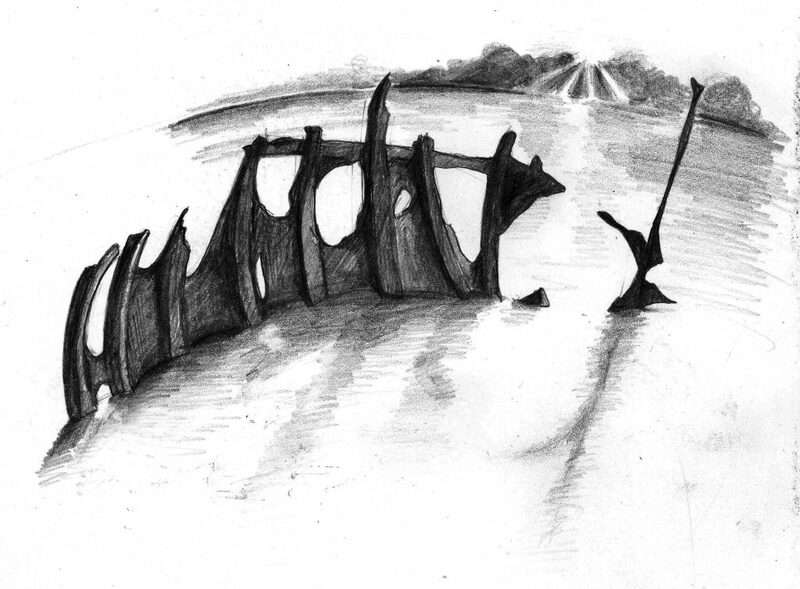 Here, there were the derelict carcasses of brilliant ships, built to ride the skies. Their histories suggested that these ships had been built to escape the tyranny of those who governed the surface cities. A new civilisation was born in the clouds, once again exiled from the surface of their own planet. I will admit that, when I discovered the reason for this sky-riding people’s downfall, I wept. It seems whatever created this poison, the poison I could find no trace of, had continued to grow stronger. No longer could the surface cities keep up with this poison by pouring it into their valleys and gulches, so a new technology was created – instead of refining the poison into a safe ichor it was pumped directly into the sky. Poisonous clouds then littered the horizon, keeping the toxins away from the surface cities. This, of course, was the end of the skyfolk. The people died, and their ships floated unmanned, for a while. The surface peoples saw this as a great success at first; their rebellious child had been silenced, and their poisons once again no longer threatened their civilisation. I cannot comprehend this; the parent civilisation killed its child, to buy itself a few more years. Not even that, for it seems within one cycle around this planet’s sun the end came for the second civilisation. The skyships began to break down and without the care of their owners they fell to the ground. Titanic vessels crashed down with such awful force that much of the surface of this planet was scorched, and all life upon the planet was ended. Almost all life, I should say. For it seemed that the second civilisation was not the only race of people to escape their underground ancestral home. At the freezing poles of the world I found the ruins of another race; one that had evolved naturally to arrive at the surface of the planet. In those inhospitable frozen wastes they made their homes. These people were fascinated with the awful green sky above them; for they had never seen the stars or even their own sun, such was the damage the second civilisation had brought upon this world. All records I could find suggest this race prospered for a great deal of time, millennia perhaps. They never dared venture beyond their icy homes, yet they were not unwise; for they knew they had been deprived of the sky. They feared the poisonous clouds that had been the end of all others, and their scientists worked to discover some ultimate solution to this toxic problem. They found it, eventually. They found a way to completely nullify the poison and convert it into clean air and useable resources. They rolled out gigantic contraptions across their homes and activated them all, cleaning the skies and earth and air. Air. Their air. Here, I believe, was the downfall of the final race of this planet. You see, it had been too long. They had lived so long upon the surface they had evolved first to ignore the poison, and finally to rely upon it. It had been so subtle, so slow, that they had not noticed this change. Their dream of cleansing the atmosphere, of seeing their own twin stars, was their undoing. They cleaned the world of all its poisons, and destroyed themselves in the process. And so there it was. A perfectly clean world, bearing so many histories upon and within its skin. I stayed on that world for centuries, absorbing their lives and past, but one day I had to move on. It is strange how detached you can become, when endings are all you are party to. That is my tale, my friend; shall I tell you another? 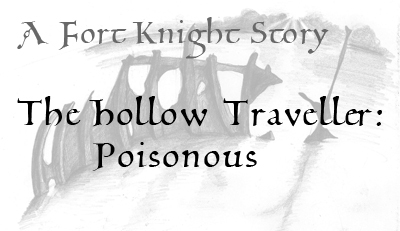 Would you care to read further stories of the Hollow Traveller? The full story of the wanderer’s journeys through a dying universe is available from Amazon now in print and eBook forms!